I've always used several calendars to plan out my life. Until recently, I used a paper desk calendar to track work-related events like project milestones. I used an insanely hacked-up version of PHP Calendar to track daily appointments and travel plans. And I used a paper calendar hanging in the kitchen to track family events like birthdays and anniversaries. And to be honest, with all of the calendars I still wasn't very organized. The distinction between types of events and the calendars weren't as clear-cut as I'm describing them, and I'd often have a work project milestone on my kitchen calendar, or a birthday in PHP Calendar, not in their "proper" locations. I decided to make Google Calendar my One Calendar To Rule Them All, and the switch has been very easy. The Ajaxy interface makes adding events insanely intuitive—click a day to add an event on that day. And I love the ability to click and drag several days to add weeklong events like conferences. The other big advantage to going digital is the ability to share calendars with other people. I can't easily send all of the data on my paper calendars to friends and family without Xerox and Fedex involved. The one issue I ran into during the conversion was with family events. I had over 50 birthdays and anniversaries I wanted to add to a calendar, and the thought of clicking Create Event and adding data for each one, or worse—hunting and pecking to find a particular day to click—wasn't appealing. So I thought I'd share my method for dumping a bunch of dates into Google Calendar. You just need a little time to get your dates together, some Perl, and a Google Calendar account. The Google Calendar doesn't have an API (yet), but it does have a hacker's little friend called import/export. 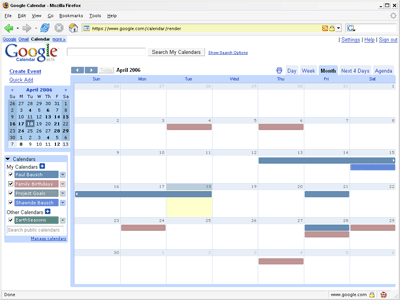 Google accepts two types of calendar formats for import: iCalendar and Outlook's Comma Separated Values (CSV) export. So if you already have calendar data in Outlook or iCal you can simply import/export at will. (Yahoo! Calendar also exports to the Outlook CSV format, so switching is fairly painless.) But I didn't know the first thing about either of these formats, I simply had a list of dates I wanted to dump. If you're building a list of dates from scratch you can use Excel. Just put dates in the first column in mm/dd/yyyy format, descriptions in the second. When you're done, save the file in CSV format, ignoring all the warnings about compatibility. I called the file family_dates.csv. Yes, this is a comma-separated value list too, but not the format Google Calendar is expecting. Plus you don't want to add an event on April 18th, 1942. You want to add a full day event for April 18th, each year going forward. This is where I turned to Perl to massage the data. This simple Perl script: calendar_csv.pl transformed the simple CSV list of dates and titles into the Outlook CSV format that Google likes to see. As you run the script it converts the year of the event into the current year, and adds an event for the next several years. Keep in mind that the larger the amount of data in your calendar, the longer it will take Google to load that calendar when you fire up Google Calendar. I originally set the $yearsahead value to 10, but with over 500 events, the calendar was noticably slowing the Google Calendar startup. In addition to Perl, you'll need the standard Date::Calc module. And if you're not in the US and would prefer dd/mm/yyyy format, simply change this bit: my ($month, $day) = to this: my ($day, $month) =. Instant internationalization! A new file called import.csv will magically appear with your dates formatted as Outlook CSV events. With the file in hand you can head over to Google Calendar. Over at Google Calendar, click Manage Calendars under your calendar listing on the left site. Choose Create new calendar, and give your calendar a name and any other details. Click Create Calendar, and you'll see the new calendar in your list. Now click Settings in the upper right corner of the page, and choose the Import Calendar tab. Click Browse..., choose import.csv from your local files, set the calendar to your new calendar, and click Import. 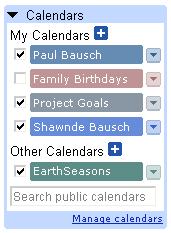 And once you have your calendar in Google, you can invite others to view and even help maintain the dates. Where I think this batch importing will be useful is for very large data sets. Imagine a teacher who wants to track the birthdays of students. It wouldn't be too hard to add the dates by hand. But a principal who wants to track the birthdays of everyone in a school will have an easier time putting together a spreadsheet than entering the days by hand. And even for my 50+ dates, writing a Perl script was preferable to entering the dates by hand. So far I'm enjoying Google Calendar, and I haven't found any major problems beyond the limited importing ability. But now I really don't have an excuse for not sending out birthday cards. 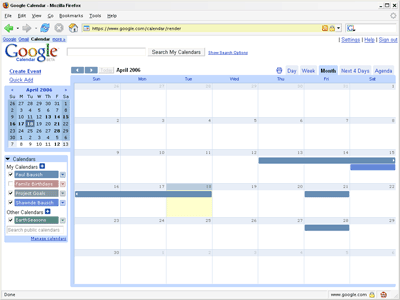 Update (4/20): Google just released their Google Calendar API. I'll bet there are scores of hackers rushing to build bulk-import tools. Using the Calendar API would be a more stable way to import dates quickly. And wow! Hello, lifehackers!